Discussion in 'Pets' started by Studio60, Jul 12, 2016. All your Cataclysm Pet Battle Needs fulfilled! Anything else in a Buddy Store product Support thread is considered 'off topic' and may be deleted. We ask that you please refrain from creating off-topic posts in Support threads. The Pet Battle Studio line of products just went on an Early Release Sale. Version 1.0.160724.1 has been submitted to the store and is now awaiting approvals. Version 1.0.160727.1 has been submitted to the store and is now awaiting approvals. Version 1.0.160727.1 has been approved and is now live on the store. Thanks for the Solid profiles Studio60, ive got all of your pet profiles and so far they gave me over 2 million gold in profit. First off; I've bought just about every Studio60 set in the last few weeks. It's an amazing compilation my pets thank you! I just tried to run the tamer achievement for outland and it's telling me I don't have the required pets. I can't figure out for the life of me how to tell what pet is actually required to run this profile. secondly, in using the planner is there any way to hook up the repeatable tamer battles? when I do they just remain gray. For Burning Crusade you just need to hit up the tactics tab in the Quest window and look for the tactics involving Bloodknight Antari. If you one of those sets, you should be able to start the profile. The planner issue is weird. Can you try starting the raid with the greyed out profiles and post a log of that? It would help me figuring out what's going on (Guide: How to Attach your Log). The community developers have been informed that Honorbuddy will undergo major API changes with the release of the Legion expansion. These changes will make it necessary to update and retest my entire product portfolio. Even though my customers are used to very frequent updates, I feel that in this situation I have to postpone all patches until this change is public. I will spend this time preparing all of my products to the best of my ability and also work on the successor to Studio Companion. I promised to update and maintain all my products through the entire Legion lifecycle for free and I will stick to that. I hope you can understand that it does not make sense to update products that require another overhaul in two weeks time. I can serve you better by preparing the next generation of all my products. I will be working hard on a new free product called StudioBot that will show you a whole different side of botting and that will then be used for all my products. I can not yet reveal all the features, but I am sure you will be amazed and happy. I can only hope you can understand my reasoning behind this. If I were to update the existing products, you would maybe get a better one for a week or two and then be left with a broken one, because I did not have the time to prepare. I am hoping Bossland will supply us with a preview version soon, so the downtime for all my customers will be minimal. I am not allowed to reveal the nature of these changes, so please don't ask. You can also still report all bugs and I will keep them on my list to make sure they are gone with the new versions. My sincerest apologies for the inconvenience. Can you please check if "Obalis" shows under tactics, i'm trying to figure out what pets i need ,but Obalis is not in the list, Thank you. 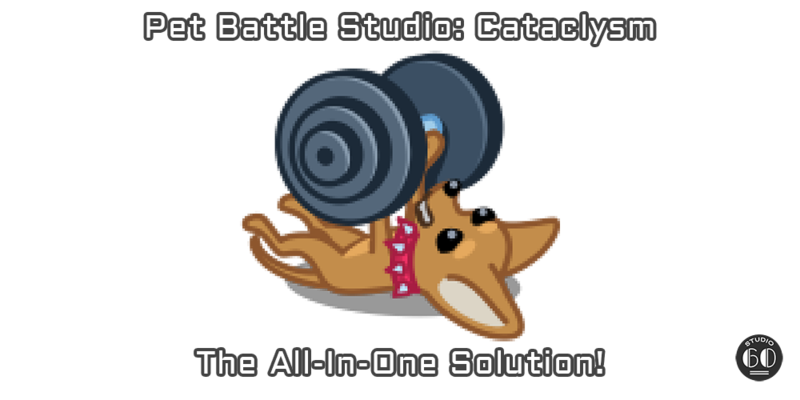 Version 1.0.161213.1 of Pet Battle Studio: Cataclysm has been submitted to the store. The changes will become available once the update has been approved. - Replaced deprecated "DismountOrCancelShapeshift" attribute value with updated value "Dismount"